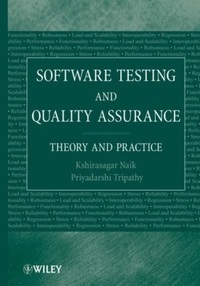 This book provides a comprehensive review of topics dealing with software testing and quality assurance. The writing style is plain but efficient, while the content covers theoretical (to some extent) and practical concepts in this field. Naik (Univ. of Waterloo, Ontario, Canada) and Tripathy (NEC Laboratories America Inc.) seem to have limited exposure to current research in software testing, but they adequately cover the fundamentals. The literature review sections are useful for researchers who wish to expand their knowledge on a specific topic, with references well placed at the end of individual chapters. The rather basic exercises are not really helpful for instructors. The work would benefit by a few more supportive examples, although the ones present are well designed to illustrate the theory, where available. Software testing may be considered a relatively specialized computer science topic, existing in the few departments where a software-testing expert resides or in academic institutions offering a software engineering degree. However, it is nevertheless an important subject, with extended applications in industry, the concepts of which are covered adequately here. This volume would be useful for instructional purposes at the undergraduate level and for professionals seeking references to more specialized information.